Dr Catherine Mercer gave a background into how she came to genetics over ten years ago – and how much testing has changed over that time. It used to take three months to get the sequence of a single gene back, now the whole Human genome can be sequenced in 48 hours. Catherine explained how the 100,000 Genome Project came about and how the structure of the UK’s NHS is uniquely placed to do a project like this. There are two types of patients involved, those with Rare diseases (defined as less than 1 in 2,000 of the population having it – totalling 6-8,000 Rare diseases in total) and separately, those with cancer. Using the skills of an observant doctor combined with the analysis of the patient’s genomes, patterns are detected with the aim of identifying the genes that are responsible for the Rare diseases – or cancer. Further detail was gone into, then Dr Frank Ratcliff ran through a number of case studies of people in the programme, including interviews with their family members. During his presentation, two not inconsiderable bound books were passed around the audience. Each contained the sequencing of the single Genome 21 – the most simple we were told. 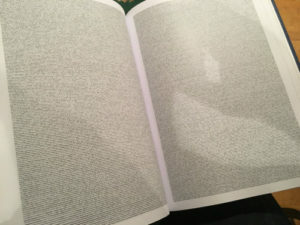 As you can see from the photo, the pages were filled with a stream of the four characters that make up DNA, tightly printed four point font. All round a very interesting insight into this important project. Unsurprisingly, after the break, many questions were raised by the audience. The next Cafe Scientifique will take place on Monday 13th May 2019. The speaker is yet to be confirmed. Find out more about the meeting arrangements. 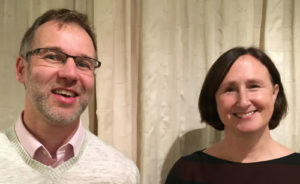 Cafe Scientifique Isle of Wight proudly supported by Isle of Wight News publication, OnTheWight.